If one place were to fulfill the definition of “Heaven on Earth” Trunk Bay on St. John is a serious contender for the title. 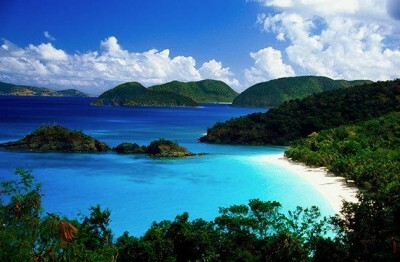 Trunk Bay is frequently voted “most beautiful beach in the Caribbean” and even the world, and it’s not to be missed! Those who have experienced Trunk Bay for themselves know that no camera has ever truly captured the breathtaking beauty of Trunk Bay. Words simply cannot explain the natural beauty; vivid blue waters gently washing up on a sugar sand crescent beach rimmed with tropical palm trees and Caribbean flowers, all framed against a soft blue sky. Just a few minutes from shopping and restaurants in Cruz Bay, Trunk Bay on St. John USVI gets our vote for the most unbelievably stunning bay in the world. The National Geographic Society calls Trunk Bay the most beautiful beach in the world for a reason. Trunk Bay has everything you could need for the perfect day at the beach. The scenery is amazing–a quarter-mile long stretch of soft and powdery white sand, bordered with lush island greenery, coconuts palms and beach mahos. Turquoise and blue water breaks gently along the white sand, leaving a trail of foamy bubbles. It’s a great beach for and adults alike–calm waters make it a perfect place to sun, swim and snorkel! The amazing scenery doesn’t stop at the water line. Trunk Bay, St. John USVI has a world renowned underwater snorkeling trail that is perfect for beginners and experienced snorkelers alike. It’s like snorkeling in huge aquarium with different schools of Caribbean fish, including angel fish, sergeant Majors and parrot fish. There’s even squid, sea rays and majestic turtles. Best of all, there are underwater signs that tell you all about the fish, coral and species that are indigenous to the area. It’s like having an underwater tour guide. What most visitors love about Trunk Bay, St. John USVI is that it’s virtually worry free, for it has the most modern and convenient facilities in all of the Caribbean. There’s a snack shack, restrooms and showers, kayak rental, chair rentals, snorkel gear rentals….anything you need, you’ll find right here at Trunk Bay. Best of all, Truck Bay is just a few miles from Mongoose Junction, where you shop, dine and enjoy the only local brewery on St. John at St. John Brewers. Stop at the old sugar mill ruins on your way back to Mongoose Junction for the perfect photo backdrop. Visiting Trunk Bay, St. John USVI is an island dream come true. Experience the Caribbean sun, soft white sand, calm waves and the crystal clear warm water that makes up Trunk Bay on St. John USVI.